Built in 2007/2008 and opened at the end of 2008, the building is currently completely empty, secured and needs to be refurbished. The complex comprises a two-level shopping centre with surrounding parking area. The facility offers 3 large units.The average size of the other 36 units is about 200 sqm. There are two escalators and four lifts. Beside the shopping mall there is a building plot (9,396 sq m). Verucchio is a commune in the province of Rimini, region of Emilia-Romagna, Italy, with a population of approx. 10.000. 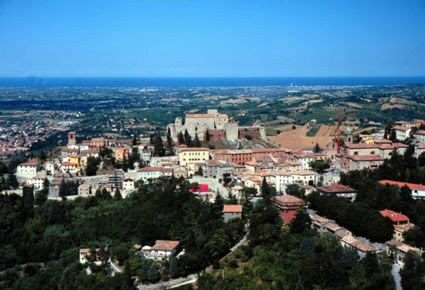 The City is located 18 km from Rimini and 10 km from the Republic of San Marino, on a spur overlooking the valley of the Marecchia river. The property is situated in Rimini´s hinterland along the main provincial road that leads to Italy´s north Adriatic coast. The shopping center "Le Torri" is the only complex of this size in the entire valley, is located in a strategic position, with a catchment area of more than 85,000 inhabitants (Rimini excluded) reached in 10-15 minutes. Other shopping centers are 12, 17 and 23 km away. The valley is rich in historical medieval where you can still breathe the culture of traditions as Verucchio, San Marino, San Leo, Novafeltria, Pennabilli,S: Agata .... and is a major tourist attraction.